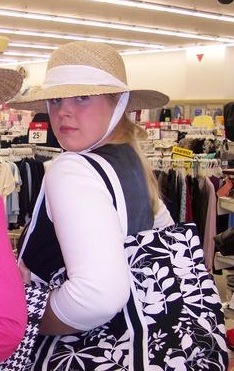 People who know me personally often refer to me as their fashion guru. People who know me via this blog have been blown away by my sultry romance novel book covers. 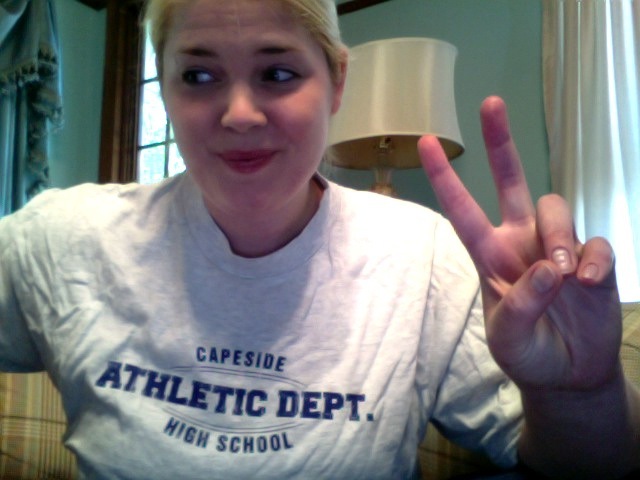 By and large, the world outside my bedroom considers me one of the great style icons of our time. Wal-Mart didn't even see this coming. However, inside my bedroom, more specifically, my closet, there are some shameful guilty pleasure secrets. 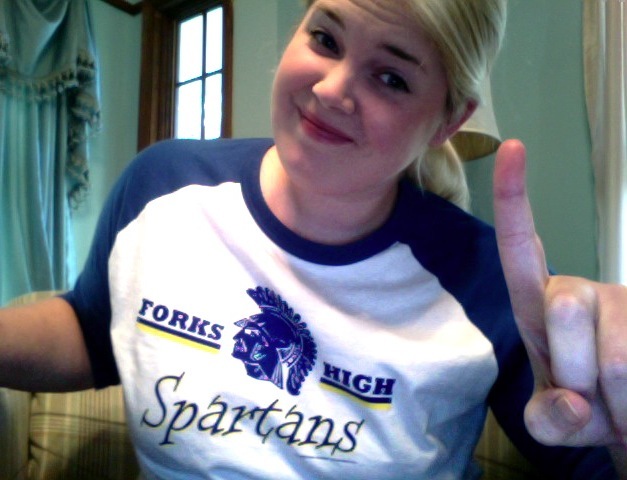 Annnd the second fictional high school I pretend to attend. This one is located right near Dawson's Creek. Yeah. 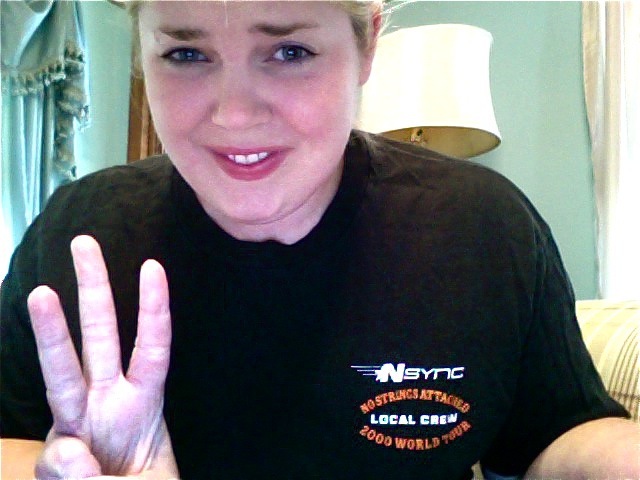 I was totally part of the local crew for the 2000 'NSync World Tour. ...Not. Tribute to the Jimmy Fallon Twilight/Robert Pattinson skit, Robert is Bothered. 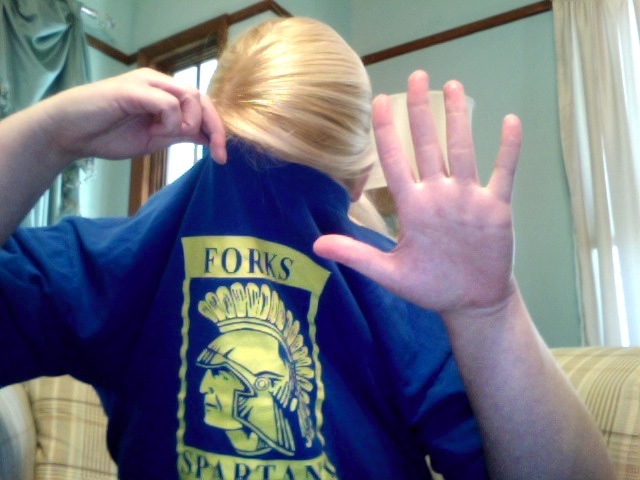 (The back says, "Team Fallon.") You don't even want to know how excited I was to get this last Christmas. For gym class at the Twilight high school. Oh. The Shame. What treasures are you hiding in your closet?? Next postBest Video Blogging Contest EVER Ends Oct. 22nd!!! That was totally my comment. Your commenting thingy is off, I think. Or I am. Personally, I love your Twilight collection! I have an Edward figurine my friend sent me for my birthday last year. My daughter took him so that he could hang out with her Monster High dolls, but he is mine (I just share well). Yesss! I have one of those, too. Between my sister, my mom and me, there’s a lot of silly stocking stuffers exchanged at Christmas time. Last year, my sister got Twilight band-aids from ‘Dr. Cullen’. I’ll admit to my Fangtasia t-shirt that was given to me by my hubby! He wore it last Halloween when he dressed up as my own personal Fangbanger. I was, of course, a slutty vampire with the best set of fangs eva! Seriously, I have the coolest, bestest fangs that I ordered online last year. They look real! 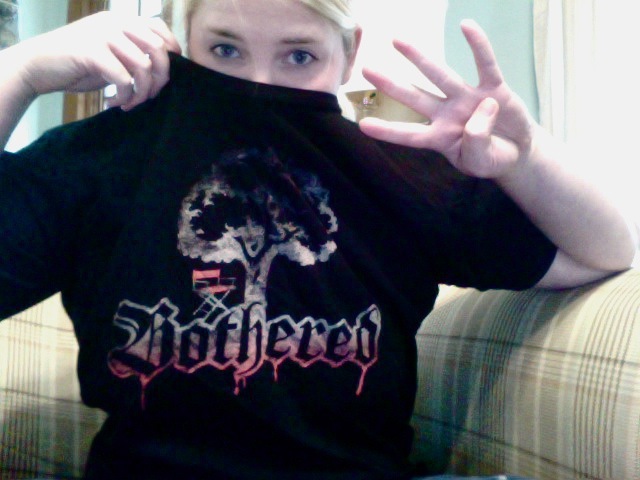 And, no, I’m not a True Blood obsessed nerd, at all! BTW, your t-shirt collection is awesome! That is what I’m missing in my collection – a Fantagsia t-shirt! (I was actually thinking that as I was writing the post. Missing that and a Buffy shirt.) Okay, so, you two need to put on those costumes again and submit a video for my vlogging contest STAT!!! Seriously. I need to see this. Pictures, at least? Please? A friend of mine (I’ll rat him out instead of myself!) has a poster from a Kenny G concert. The thing is, Kenny G signed it for him. He’s in a jazz quartet and everything, so he just doesn’t know what to do with it. He’s far to embarrassed to show anyone, but can’t just throw it out. Your photo progression there is just fantastic, by the way. Oh. Wow. (Did you see Kenny G perform with Foster the People on SNL last week? Apparently Katy Perry’s “Last Friday Night” made the saxophone relevant again.) And no! You, I mean your friend, can’t throw it out – ever! That is a treasure. In my closet, I have a bunch of young adult books I am “saving” for my children when they are old enough. Artemis Fowl was a good book, ok? LOL That is music to my ears! I’ve probably seen that Halloween “Robert is Bothered” 10 times. ha! I can never throw away a book! The young adult ones are the best ones, I don’t care what anyone says!!! Wait. This is something to be ashamed of? Man. I had no idea. I guess, I need to feel less awesome and more ashamed. P.S. – I didn’t manage to squeeze this into my romance novel cover post, but I think you’ll appreciate it: I actually worked in an independent book store for two years (my first job), and one of the authors we had come in for a book signing wrote full-on romance novels. She said it paid her kids’ college tuitions!!! I need to get on that shiz, like, yesterday. No. I LOVE Twilight. Wait. What comes after love? Okay. I know this. Let me rephrase: what comes after obsession? Now, the most exciting thing I have in my closet is Li’l D. Pretty appropriately given the title of his mama’s blog, he loves hiding out in there with his toys. Hee. Well, then. You have the cutest closet in the WORLD!! Wear that shiz loud and proud, girl (or should I say, hot momma)! I think you might have just swung the trends of fashion in the direction of wrinkly T-shirts. The world won’t know what hit it. I’m a great fan of t-shirts, too. I splurged and bought a Pink Floyd dark Side of the Moon shirt a while back and have a bunch with silly messages like “There’s room for all of God’s creatures, right next to the mashed potatoes” and “My imaginary friend thinks you have mental problems”, etc. I also made t-shirts for my brothers with the logo for our fictitious restaurant with all four of us in full Greek costumes (our faces photoshopped onto someone else wearing the clothes). Hmmm, an idea for a future post! I have a Gryffindor quidditch jersey. It’s very rugby-like. Says Potter 56 on the back of it. Our doorgirl at work has a Durmstrang messenger bag. I’ve been scouting for that on eBay for three years now, no luck.